Content marketers have a lot to learn from journalists and vice versa (even though both groups don’t want to always admit this). 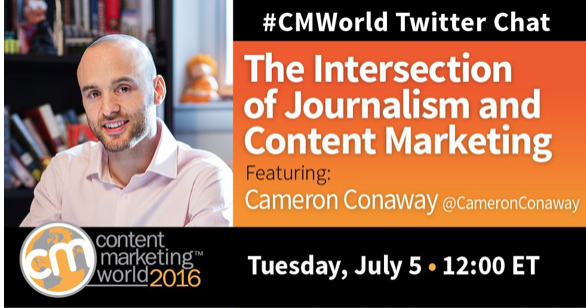 In our recent #CMWorld Twitter chat, we were joined by Cameron Conaway, journalist and content marketing manager at Flow, who has experience in both these worlds. He led a conversation that offered ideas on how journalists can transition to content marketing. A few highlights of the chat are below. Visit this week’s Storify for even more great conversations on this topic. 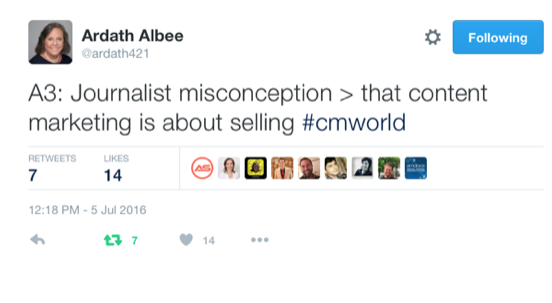 So – what are some differences between journalism and content marketing? And even with these differences, what are we able to learn from both? This is a great chat – one in which we learned just how many folks in our content marketing community have a journalism and/or news background! We just love learning new things and are so glad for this chat this week. Thank you Cameron and friends! See Cameron speak more about journalism and content marketing at Content Marketing World this September. Use code BLOG100 when you register to save an extra $100.